Sometimes I need to manually dial an extension after the call is answered. How do I dial digits in turboDial? Why is my call being immediately disconnected before anyone could answer? Can I call a number that is not in Infusionsoft? Should I make calls from ‘This PC’ or from a phone device? How can I change my mind and stop a call before it connects? The number keys on your computer keyboard can be used as a dialing keypad. Pressing number keys will create the digit tones you need to dial an extension. For example, if you call a number and want to reach extension ‘123’ then when the call is answered and you are prompted for the extension press the 1 key, then the 2 key, then the 3 key on your PC keyboard. Also, if during a call you are prompted to “… enter the first few letters of the name …” you can dial those letters using the letter keys on your PC keyboard. For example, if you want to dial ‘Smith’ you should press the ‘s’ key, then the ‘m’, then the ‘i’ key, then the ‘t’ key, then the ‘h’ key on your PC keyboard. Be sure your cursor is not planted in the Call Notes box in turboDial. When your cursor is in that box your keystrokes are recorded as typed notes rather than digit tone key presses. The most common reason for an immediate hangup is that the phone number is invalid. In this case the calls will never succeed. You might try calling the number from a mobile phone or a landline so you can hear if there is an announcement. The second most common reason is that the number called is busy and there is no voice mail system associated with their phone service. In this case the call will succeed later when the number is not busy. The third most common reason is that the telephony network in the location where you are calling has a congestion problem and could not deliver the call. In this case the call will succeed later when the congestion is reduced. In all of the above cases Twilio disconnects your call immediately rather than charging you to listen to a busy signal or a phone company announcement. Yes, you do that by typing the number into the “Search or Number” field and then choosing “Enter Number” from the list of phone numbers for the contact you are currently displaying. You can also “paste” numbers into that field you have copied to your clipboard from other web pages or applications on your computer. 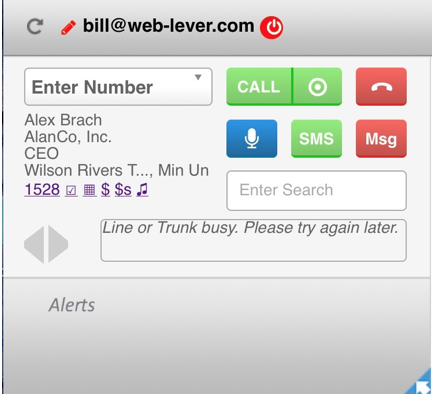 Once you enter your number in that field you can click the “Call” button and proceed as normal. However, calling a number this way raises the question of – “Should turboDial attach a note to the Contact Record? – because the number you enter may not be associated with the displayed contact. So, if you regularly have a need to call numbers that are not associated with Contacts we recommend you create a special Contact in your Infusionsoft account, named something like “Manual Dialing” and place all of your manually dialed phone calls with that special Contact Record displayed in turboDial. And in this approach you can allow the note to be attached to the Contact Record so that your Contact named “Manual Dialing” will hold notes for all of your manually dialed calls. Note: If you create the “Manual Dialing” Contact Record, be sure to set the Billing Country field to your country. There is no single recommended answer. For most people it will be a matter of personal preference. In some cases the capabilities of your hardware and Internet connection will dictate the answer. You like the reduced cost from Twilio. In North America a call from your PC/Mac to a phone is 1.75 cents/minute and a call from your phone to a phone is 3 cents/minute. The majority of turboDial calls are made using “This PC”. For any type of call, from “This PC” or from a Calling Device, you can simply press the Hang Up button on the turboDial panel and your call will be immediately disconnected. If you are calling from a Calling Device and do not have ready access to the turboDial panel then you must first answer the device when turboDial calls it and then you can hang up that device before it begins connecting to the person you had planned to call. Note that it is important to answer the call to your device – if you don’t answer and your voice mail system answers instead then your voice mail system will be connected to the person you were calling. If you have changed your mind and don’t want to continue the call then you should first answer the call to your device and then hang up.